There is no single pathway to success in sport. If there were, we wouldn’t be able to compare the stories of Chrissie Wellington, who discovered her remarkable talent late in life but went on to dominate IronMan Triathlon within a few years, to that of another endurance athlete, say Floyd Landis, who began cycling at school, with a single minded focus that took him to the professional level many years later.There are countless cases of both examples, not only in endurance sport, but in skill-based sports – cricket or rugby players who “arrive” in their 20s, compared to the “prodigies” who are ear-marked for success from their early teenage years, or even earlier. I am sure that in your own country, you can instantly think of one example of each. But is there an optimal time to begin specialization in a particular sport? This is such a loaded question that I can’t possibly answer it, or even begin to cover it in one post. So with that question begins a series of articles where I’ll look at some of the evidence for whether young athletes who specialize very early on are more or less likely to succeed than athletes who delay high training volumes, competition and specialization in sport. What do elite athletes do? Is there evidence to say whether early or late specialization is better? What does science (that is, me…!) make of the 10,000 hour concept that that it takes 10,000 hours of deliberate practice to become an ‘expert’?Really, what this gets at is whether there is such a thing as “talent” or whether hard work and practice allows anyone to succeed. It’s the Coyle, Syed and Gladwell argument in Talent Code, Bounce and Outliers. But what does physiology make of it? What is the concept of Long-Term Athlete Development (LTAD)? Where are its strengths, and where are its shortcomings, both practically and physiologically? What are the implications of all this for coaches, parents, and young athletes? So with that in mind, let’s get started towards trying to answer that question. The title of the paper kind of gives away its conclusion, but don’t worry, there is a lot more to it, including my conclusion that the paper does NOT in fact make this discovery, and there’s something much more complex going on. Here is a systematic breakdown of the paper, looking at the main research question, the rationale behind the research, its findings and how they might be interpreted. The paper aimed to sort out which of two models for developing elite athletes was most effective in producing elite performances. Those two models are summarized in the diagram below. But before we begin, we have to define specialization. In the paper, it has a rather clumsy definition, where it’s a hybrid of being defined as a focus on a specific sport, as well as being measured in hours of practice in that sport. In many cases, specialization and training volume will be related – the more you focus/specialize, the more time you have for that sport. For example, a 15-year old with 2 hours a day to train will train more for Sport A if they are specialized than if they split the 2 hours between Sport A and Sport B. However, this is not always the case – the same 15-year old can be “diversified” and do both sports, but still do more training in each than the specialist if they sum their time – A + B might equal four hours a day, not necessarily two. So on your left is this model of “early specialization”, where an early focus on a sport is recommended. This is motivated largely by the framework that it takes so many practice hours to become proficient, and so you have to start young, and focus young, in order to accumulate them. This is the Ericsson argument, and if you’ve read Bounce or Outliers, you’ll know of Ericsson – he did a study on violinists in Berlin and found that the outstanding violinists had practiced for almost 10,000 hours, compared to only 8,000 hours for the “good” and 4,000 hours for the “normal” violinists (the ability of the violinists was assessed by the professors and teachers, in case you were wondering). That study led to this 10,000 hours concept, which has since been applied to all kinds of skills, including sport. There is an inherent problem with this, because sport is not the same as playing a violin in that there are without doubt physical attributes that training cannot change but which determine one’s “ceiling of ability” in most sports. The most obvious (bordering on ridiculously, in fact) example is that if you stand 1.50m tall, you’ll never be a basketball star, even if you accumulate 20,000 hours of practice. Your genetic make-up eliminates some of your options, it determines your ceiling especially when physiological characteristics are so significant to success, and then training helps to optimize how close you get to reaching your ceiling. That’s why no one succeeds without some training, but without question, some have more “talent” for a specific sport than others…. Whether the same is true of a skill-sport like tennis is debatable. This is a great topic, but not one for today – that’s why I’ll set it aside for a future post as part of this series. Let’s leave this as saying that this kind of thinking drives the early specialization model. On the negative side, there is also evidence of higher attrition rates with early specialization, and also potential negative health outcomes. The issue is whether a young athlete who specializes at 9 or 10 is likely to continue with the sport beyond say 18, and there is some evidence that the answer is no. On the right, the contrasting model is Early Diversification. Here, children play a number of sports, the theory being that they develop a diverse range of skills, which are transferred across sports. The proposed upside is that it promotes intrinsic motivation (let the child choose for themselves) and balance through increased exposure, and also ensures longevity. The downside is that it may be too late, and by the time the person reaches adulthood, they may never overcome a potential late focus on training for a specific sport. The only way to differentiate is to ask the question of elites, and that’s exactly what the study did. This kind of study is usually done by looking backwards in what is called a retrospective design. Athletes are given questionnaires asking them to recall how much time they spent training each year. Your alarm bells might be ringing, and rightly so, because this is a fundamental problem of this kind of research – it’s reliant on memory and we all know that this is not infallible – can you remember how many hours a week you spent training in 2003? The authors of the paper acknowledge this and they use some methods to confirm the memory of the athletes they interview, and conclude that the recall is reasonably good, given the limitation. What will really help is a 20-year prospective longitudinal study, which I’m sure is on the way at some stage in the future. The athletes interviewed in the study were high-level Danish athletes who were split into two groups, Elite and Near-Elite. Elite athletes were those who had achieved Top 10 placings in World and Olympic competition or podium finish in European competitions, which is pretty impressive. I’m looking at repeating this study here in South Africa, and if we set the standard at Top 10 globally, we’d be lucky to get 20 athletes! The Danish got 148. In the Near-Elite group were 95 athletes who hadn’t met those criteria, but who were still on the Danish sports programme. The athletes were then given a questionnaire looking mainly at how many hours a week they practiced, from the age of 9 up to the age of 21. They also had to report what other sports they did and when they reached certain “milestones” in the sport, such as first international competitions, when they began intense training and when they reached the elite level. The other very important thing to point out is that they only sampled athletes in what are called CGS sports – these are the sports measured in Centimeters, Grams and Seconds. Think Rowing, swimming, athletics, kayaking, weightlifting, sailing, triathlon, cycling. This is vital, because this study is NOT going to allow us to answer whether a tennis player or a golfer should start younger. It also looks at sports that are typically more favoured by later specialization, because in general, peak performance age in these sports is in the mid to late 20s. Sports like diving and gymnastics, on the other hand, are characterized by a peak in the late teens, early 20s, and that’s a significant point to make. The first is that the Near-Elite group had actually gotten an earlier start than those who would go on to be elite – by the age of 9, they’re 160 hours of practice time AHEAD. That difference persists up to the age of 18, by which time there is no difference between the Elite and Near-Elite athletes. Then, at the age of 21, the Elite athletes have pulled well clear, with about 1,100 hours MORE training than the Near-elites at that age. And finally, there was no difference in the number of months spent on other sports – 63 months for the elites, 62 for the Near-Elites. In other words, during the 12 year period of sampling, both groups spent just over 5 years in total practicing in other sports. What is not reported is how those sports were spread out – were they done predominantly from 12 to 15, were they done for 7 months a year or all at once? The practice trajectory: When should the training volume be ramped up? So this plots the average number of practice hours PER week over time in the two groups. Elites are shown in the beige, the Near-Elites in blue. Quite clearly, they follow different trajectories. 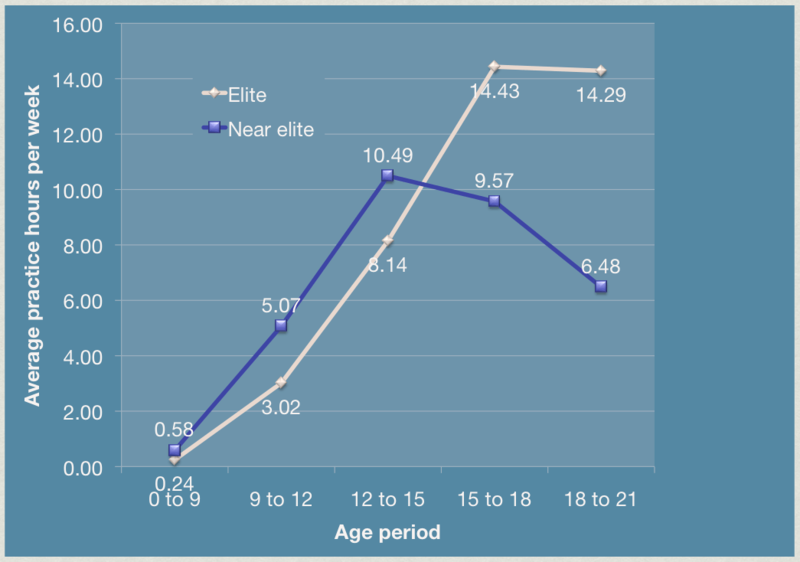 Up to the age of 9, as we said, the athletes who will go on to be Near-Elites do more than twice as much practice – it’s an artificially low number, of course, because there’s probably zero training up to maybe 5 or 6 on average, but it had to start somewhere! So quite clearly, they follow very different pathways, and end up in different locations – one group goes on to be in the Top 10 globally or Top 3 in Europe, the other doesn’t quite make that level. They may yet, of course, the study was simply a retrospective look of a sample. The authors then made five major conclusions. Elite athletes specialize later in their career. Read that last conclusion again, for it is perhaps the most important one in the paper: “There is no delay in the athletic development that cannot be made up later with late specialization”. I actually disagree subtly with this conclusion. To me, the primary finding of the study is that success and performance in these CGS sports is NOT determined by how much TIME is spent training as a child, and that increasing the training volume later (after 15) is more than able to make up for time NOT spent training when even younger. As for the issue of specialization, that’s a conclusion not supported by the results! The time spent on other sports was the same – it may have followed a different pattern, but this wasn’t reported. All we know is that both groups did around 62 – 63 months of training in other sports over this period. Specialization, defined as a single-focus on a sport, has nothing to do with ultimate performance, then. It’s more about time spent at different ages, and that “practice trajectory” I showed in the above graph. However, in the interests of your time, and mine, I’m going to leave it overnight, and pick up this discussion again. Let’s just say that this study was much more focused on training time in the final chosen sport, and it makes quite a nice case for delaying high training volumes until the mid to late teenage years. Effectively, you need to replace “specialization” with “high training volumes” and then you have the real finding of the study! And that’s where the discussion will resume tomorrow! That, and also we’ll look at some of the reasons why that graph of practice time would look like it does – it may not be what you think! I’m sure there will be comments and feedback, and as always, it’s most welcome! Join us tomorrow for more on this paper, and the issue of specialization vs training volume.